SAN FRANCISCO, Calif. /California Newswire/ — Executives from some of the leading firms in the consumer neurotechnology market are scheduled to make presentations at the 2012 Consumer Neurotech Conference, to be held in San Francisco on October 23. 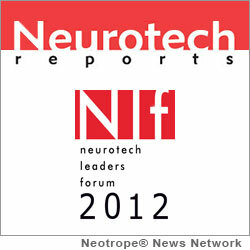 The new event takes place during the 2012 Neurotech Leaders Forum, now in its 12th year. Steven Miller, Director of Global Neurolab Operations at Nielsen NeuroFocus, will give a presentation on applications of brain sensing technology in market research, advertising, and retailing on the morning of October 23. NeuroFocus was acquired by Nielsen in 2011. On the afternoon of October 23, Amy Kruse, vice president of Intific, Inc., will speak on neurotech applications in sports and gaming. Intific has collaborated with neurotech researchers to develop games and virtual environments used in the military, education, and gaming applications. Geoffrey Mackellar, CTO of Emotiv Life Sciences, will speak on an afternoon session devoted to advances in EEG headset technology. Emotiv's 14-sensor EPOC wireless headset is used in a number of games and educational applications. Adam Gazzaley, M.D., Ph.D., director of the Neuroscience Imaging Center at UC San Francisco, will discuss how neurotechnology is being used to enhance cognitive abilities. In addition to the sessions on consumer applications of neurotechnology, Tuesday's agenda will feature discussions of other noninvasive neurotech systems. Chip Fisher, CEO of Fisher Wallace Laboratories, will describe his company's low-cost transcranial stimulation system. George Carpenter, CEO of CNS Response, will describe his firm's use of EEG waveforms in diagnosing psychiatric disorders. And Lee Gerdes, CEO of Brain State Technologies, will describe his firm's system targeted at the wellness market. For more information on this year's event, contact James Cavuoto at Neurotech Reports at http://www.neurotechreports.com/consumer or call (415) 546-1259. Founded in 2001, Neurotech Reports (www.neurotechreports.com) is the leading source of information on the neurotechnology industry. The firm publishes a monthly newsletter, Neurotech Business Report, along with the market research study, "The Market for Neurotechnology: 2012-1016."